Introduced in 1999, Buffalo Bills Western Cut Beef Jerky continues to be a hit with those who enjoy a true, Western-style jerky. Made solely with US-raised beef, this style of jerky is thin-sliced, tender and mouthwatering! 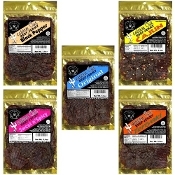 Buffalo Bills Western Cut Beef Jerky is available in 4 flavors - Black Pepper, Original, Sweet 'n Spicy, and Teriyaki. Choose your FLAVOR and HEAT below. Our Teriyaki flavor was chosen as one of the Top 4 Beef Jerkys in the USA by Backpacker® Magazine.